*The insurance is more expensive from the age of 60. NB! 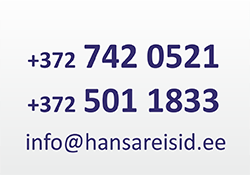 The prices are different in Hansareisibüroo’s Valga office! Tourist visa – one entry visa valid up to 1 month from 45 EUR.